On a recent trip to Italy, I was hiking around the Geoparco Del Beigua in Liguria. It contains what is identified as a Neolithic stone for resharpening greenstone axes, among other carved stones. Actually, the entire site consists of reproduction stones, the originals removed for protection. In case you have forgotten (as I did), the Neolithic period is the end of the stone age, generally defined between 4,500- 2,000 BCE. This is right before the copper or bronze age begins. Explanatory text at the entrance to the site. Geoparco Del Beigua, Liguria, Italy, 2016. 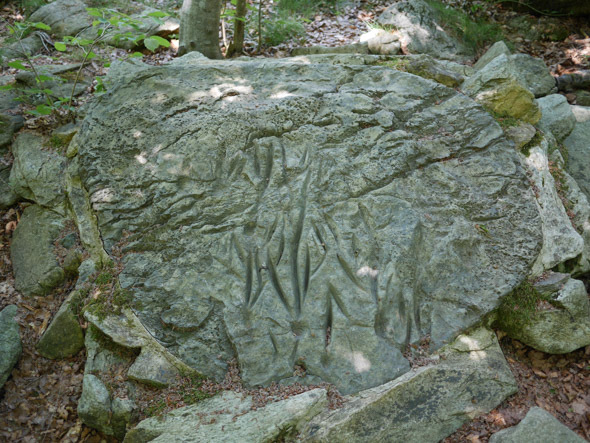 Stones like this are not unique to Italy, they are found all over Europe, and are simply called “grooves” or polissoirs by archeologists. These stones were first identified as sharpening stones in the mid-19th century, though now this is debated. Some archaeologists believe they are a type of calendar or perform another symbolic function. The explanatory text struck me as largely conjecture. The comment that sharpening was entrusted to experts is doubtful to me, as well as the idea of a sacred element in sharpening. Such a large stone, out in the open, would suggest a more communal activity, rather than ritual expert use. I’d bet that resharpening, especially stone axes, was a common enough occurrence that anyone using one would have to perform maintenance on the edge. There are many small sharpening stones from the Roman era that have a small hole drilled into them, so they can be carried with the user. Neolithic Sharpening Stone. Reproduction. Geoparco Del Beigua, Liguria, Italy, 2016. Neolithic Sharpening Stone. Reproduction. Detail. Geoparco Del Beigua, Liguria, Italy. 2016. 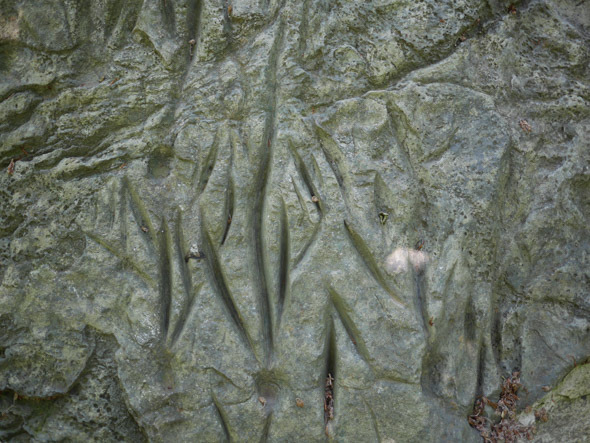 More troubling, is that these grooves don’t reflect the way a stone would wear down during the course of sharpening. If the axe was used in these grooves, it would dull the cutting edge. Only by twisting the axe (which could account for in the curves of the marks) would it be sharpened. Another problem is that these grooves would have had to be defined by some other tool before the sharpening began. A relatively flat area of the stone would be much easier to find and use, it seems, which is the most common shape for sharpening stones. So the idea that these were a type of jig for sharpening — which would also negate some of the need for an expert to perform the sharpening — seems suspect. This was no ancient version of a Chef’s Choice knife sharpener, which sharpens both sides of the knife at the same time. These questions aside, what blows my mind is that natural stones are still used by many to sharpen knives. Are sharpening stones the only stone age technology still in common use in the 21st century? Hi Jeff, Great article as always. Hey, I’ll be going to the SE Guild of Bookworkers conference in Sept. Can I send you my paring knife while I’m out of the bindery (you made it for me a few years ago when you were moving) so that you can assess my sharpening ability and probably put a new angle on the blade? Might depend on what you consider common use, but spinning fiber into thread on a drop- or supported-spindle goes back at least to the Paleolithic era and is still practiced as an economic activity in some places, as well as by hobbyists in lots of places. Weaving on a simple loom is probably Neolithic as well. (Spinning wheels and shaft looms are medieval.) Not that textiles last well in the archaeological record. There does seem to be a grand tradition of archaeologists labeling things as sacred when they find artifacts or technologies they’re unfamiliar with. Very true, I’m not that familiar with fiber history. Thanks! One Stone Age technology still in use: the thinnest scalpel blades are made from obsidian. Thanks, very interesting, the obsidian knife. It rocks! Next PostNext The Scratches Don’t Lie and The Big Board: Impressions from Teaching in the Netherlands.